On Saturday the 22nd of October, as part of the celebrations for 500 years from the birth of Giorgio Vasari, the architect and decorator of the Uffizi , author of “The Lives of the Most Excellent Italian Painters, Sculptors, and Architects from Cimabue to Our Times”, an exhibition of contemporary art was opened in the Florentine house of Vasari. 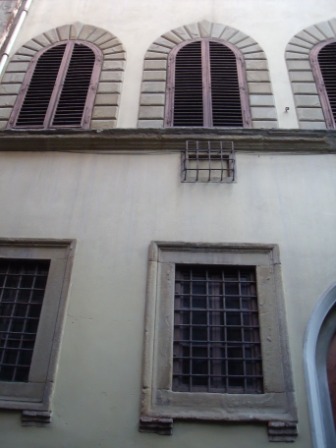 The house, meant to be for the time a real status symbol, is situated in Borgo Santa Croce, two steps away from the Church of Santa Croce. 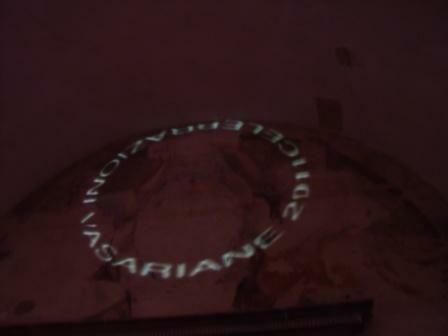 In the courtyard are projected the credits of the exhibition of contemporary art. It looks as a cinquecento Florentine Palazzo with the true, real gem, on the main stairscase, first floor, the Hall of Arts, ideal presentation of Vasari idea about arts, painted by himself. The walls are covered in frescoes with portraits of famous artist, allegorical scenes about arts and one about the discovery of the design through the projection of shadows on the wall. The installations of contemporary art are well inserted in this historical surrounding. Quite impressive the Quadreria: a room with walls covered by paintings( quadri) illuminated only by candle lights.